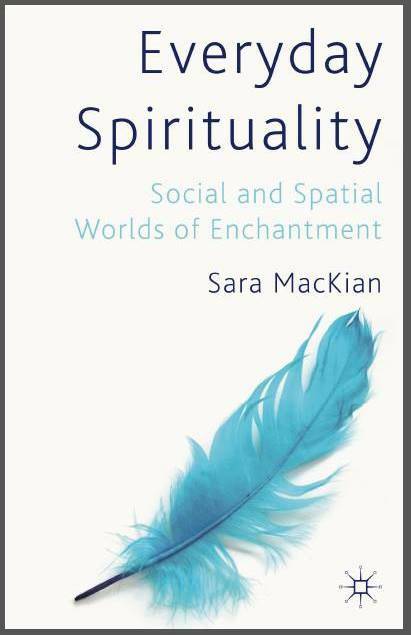 MacKian (2012) Everyday Spirituality: Social and Spatial Worlds of Enchantment. Basingstoke, UK: Palgrave Macmillan. Paterson, Dodge and MacKian (2012) Introduction: placing touch within social theory and empirical study. In: Paterson, Mark and Dodge, Martin eds. Touching Space, Placing Touch. Ashgate. MacKian (2011) Me and ME: therapeutic landscapes in an unfamiliar world. In: Lloyd, Cathy and Heller, Tom eds. Long-term Conditions: challenges in health and social care. London: Sage. MacKian (2011) Crossing spiritual boundaries: encountering, articulating and representing otherworlds. Methodological Innovations Online, 6(3), pp. 61–74. MacKian and Goldring (2010) ‘What’s he looking at me for?’ Implications of age and generation for gay men’s health promotion. In: Jones, Rebecca L. and Ward, Richard eds. LGBT Issues: Looking Beyond Catagories. Policy & Practice in Health and Social Care (10). Edinburgh: Dunedin Academic Press, pp. 16–29. Edge and MacKian (2010) Ethnicity and mental health encounters in primary care: help-seeking and help-giving for perinatal depression among Black Caribbean women in the UK. Ethnicity and Health, 15(1), pp. 93–111. MacKian (2009) The art of geographic interpretation: Making sense of qualitative data. In: DeLyser, Dydia; Aitken, Stuart; Crang, Mike; Herbert, Steve and McDowell, Linda eds. The SAGE Handbook of Qualitative Research in Human Geography. UK: Sage. MacKian (2008) Complex cultures: rereading the story about health and social capital. In: Gupta, K. R.; Svendsen, Gunnar Lind Haase and Maiti, Prasenjit eds. Social Capital (Vol. 2). New Delhi: Atlantic, pp. 110–134. MacKian (2008) What the papers say: Reading therapeutic landscapes of women’s health and empowerment in Uganda. Health & Place, 14(1), pp. 106–115. MacKian (2004) Mapping reflexive communities: visualising the geographies of emotion. Social and Cultural Geography, 5(4), pp. 615–631. MacKian, Bedri and Lovel (2004) Up the garden path and over the edge: where might health-seeking behaviour take us? Health Policy and Planning, 19(3), pp. 137–146. MacKian, Elliott, Busby and Popay (2003) ‘Everywhere and nowhere’: locating and understanding the ‘new’ public health. Health and Place, 9(3), pp. 219–229. MacKian (2002) Complex Cultures: rereading the story about health and social capital. Critical Social Policy, 22(2), pp. 203–225. MacKian (2000) Contours of coping: mapping the subject world of long-term illness. Health and Place, 6(2), pp. 95–104.